Learn the process of creating graphic novel-style sequential art. On this intensive course one-week course, you will learn how to get your ideas down on paper and turn them into a full comic page to add to your portfolio, with practical exercises and personal feedback from our course tutors. Eoin McAuley: Lightning Strike Comics. Nick Roche: Transformers, Dr Who, IDW Publishing. Robert Carey: Lightning Strike Comics, Ness. Leeann Hamilton: Finn & Fish, Kitteenies, Jam Media, Nebula Interactive and Neo Magazine. This course covers several key areas following the entire creative process from Concept to Publication. Eoin is an award winning entrepreneur and graduate of Trinity College Dublin. He is the lecturer for Entrepreneurship for 2nd Year Games Development in Pulse College. Throughout his career Eoin has both partnered and consulted for various companies across a range of services including; corporate banking, hospitality and media & entertainment. Currently Eoin is writing a graphic novel detailing the life and exploits of William Lamport funded by a grant by South Dublin County Council. Tríona Farrell is an illustrator/sequential artist from Dublin. Tríona’s background includes a BA in History and Classics and a Masters in Design Practice, with plenty of experience working in the industry. As an illustrator, she primarily works in fantasy themes and works from realism to a more stylistic look. She adores drawing character design and landscape especially! She has worked with numerous private clients and companies. As a comic artist Tríona primarily works in colours as a colourist. She has done work for Boom! entertainment and Titan comics as well as numerous other smaller publishing companies. Nick Roche is one of Ireland’s most prolific comic-book writer/artist. Nick’s credits include TRANSFORMERS: SINS OF THE WRECKERS for IDW (Script and Art; 2016), LAST STAND OF THE WRECKERS – voted IGN’s Best Transformers Comic Story Of All Time – (Art; co-scripted w/James Roberts); DEATH’S HEAD & NEW WARRIORS (Art; Marvel Comics); and creator-owned, all-ages horror comedy MONSTER MOTORS with Minions screenwriter Brian Lynch (Art, IDW). Nick is also the current album artist/music video designer for rock band THE DARKNESS. Leeann Hamilton is a Comic maker, illustrator, graphic designer and game asset designer. Included among her self-published work are the critically acclaimed: Finn & Fish and Kitteenies. Throughout her career Leeann has worked for Kavaleer Productions, Jam Media, Nebula Interactive and Neo Magazine. In November 2016 Leeann was inducted into the Irish Comic News (ICN) Hall of Fame in recognition of her work. Robert Carey is an award-winning artist from Dublin and has worked on numerous Irish and international comic book publications. Robert is currently working on Ness, a four issue horror mini-series (written by Chris Welsh). His illustrations (with colours by Dee Cunniffe) for a story in a Norwegian political magazine recently won an award for journalism. Robert is a frequent presence at conventions across Ireland and the UK and also lists storyboarding for film productions among his work portfolio. 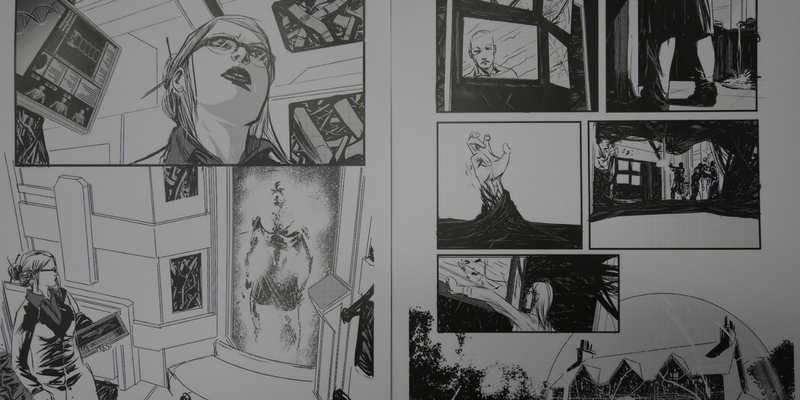 Cormac Hughes is an award winning artist and prolific contributor to comic book publications in Ireland. Included among his projects are: Lightning Strike, Unseen Shadows, Red Sands, Professor Elemental Comics, Red Lotus, The Legend of William Lamport and the upcoming No Code Anthology. Miriam Abuin studied Journalism at the University of Seville (Spain) and underwent further training as a translator at the Open University of Catalonia. She started her path in comics by translating and lettering Underground by Jeff Parker and Steve Lieber. She freelances in English into Spanish translation and vice versa; and since Underground in comics lettering. She has lettered comics for Lightning Strike, Dublin Comic Con, Flare Book Series, Punt Press and Professor Elemental Comics. Prospective students should display an enthusiasm for sequential art and comics, and a desire to take ideas from initial concept to finished product. There are no minimum academic requirements for acceptance onto this course, however it is advised that student have a basic proficiency in drawing skills. Upon receiving your application form our Admissions Team will be in contact to discuss our payment options in securing your course place.